George’s letters begin in August 1914, and the last in the main collection is dated 5 July 1916. The mail was the only way that he and his brothers could stay in touch with home other than visits on leave, but they were infrequent. Apart from his first postcard, all letters were addressed to his mother, who obviously did all the letter-writing to George (and to his brothers). There is no indication of why the sequence ends when it does, but we know that his army career was not yet over. Up to mid-1916 his service fell into five periods. From enlistment in Suffolk in August to February 1915 he was training at Shorncliffe near Folkestone in Kent. From February to May he was in barracks in or around Aldershot. 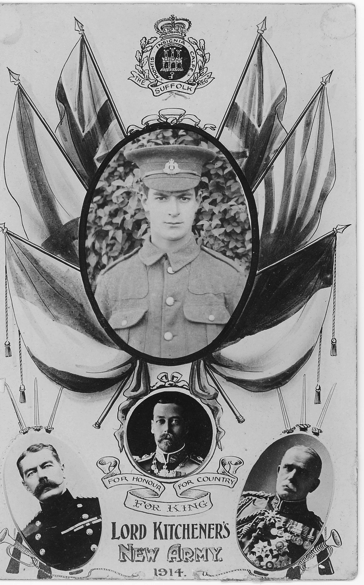 From the beginning of June until he was wounded on 4 November 1915 he was in France. He was brought back to England in November, recovering in Graylingwell War Hospital, Chichester, Sussex until February 1916, when he returned to the army at Felixstowe and Harwich. During these two years it is clear that his attitude to the army changed substantially. Before he went to France he seems to have accepted the discomforts and discipline of army life fairly cheerfully. He never quite lost the gentle ironic humour which he showed when he explained to his mother why he would be sending his savings home: I might lose it if I saved it here. Some of them walk round the room in their sleep to see what they can find (4 Dec14). But he was deeply affected by his experiences at the front, and thereafter he expressed a steely determination to be discharged if possible but on no account to be sent back. In view of that it is surprising to find that he was transferred or re-enlisted (surely for home service only) and served in one (or two) Scottish regiment(s) before his eventual discharge in March 1919. His service record was unfortunately lost in the Blitz in 1940. There are no clues in the letters whether there were particular reasons why George volunteered, or why he did so before his two brothers. He enlisted in the Suffolk Regt. on 24 August as 12279 Pte. G. Goodchild, C Company, 7th Battalion (or ‘7/Suffolk’), in 35th Brigade, 12th Division. 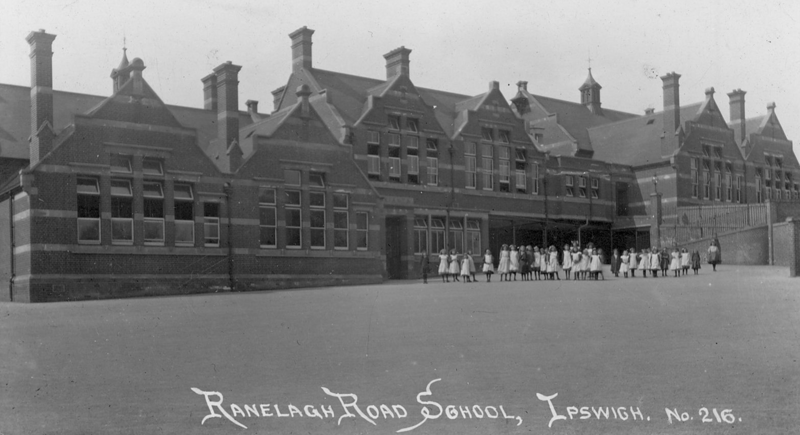 His first postcard has no date but was probably written that day in Ipswich: Dear Parents, Just a line to let you know I got here alright, do not worry. George. On 27 August he wrote to say they had moved to Bury St Edmunds after one night in Ipswich. We have been in tents two nights but tonight I am going to sleep in the barracks… There is a lot just gone from here so there is room in the barracks now. There is two or three hundred sleeping in tents, our tent was full up, and when I went to sleep I was in the tent, when I woke up in the morning I found myself outside. The first night 20 of them slept outside with a blanket round them. He had already seen people he knew, young Jackaman, Ted Bailey and George Martin from Bealings (all of whom were killed in 1915-16), and he was determinedly optimistic: I do not mind being here at all, it is the best living in the world. He spent some time exploring Bury. This is a big place, I do not know the way about yet, only there is no trams here…Wednesday was market day so I went at two o’clock and had a look round. On 30 August the battalion transferred from Bury to Shorncliffe by train, marching proudly over London Bridge from Liverpool St station. First impressions on 4 September were favourable in spite of eight hours of drill a day and being back in tents. I like being here better than being at Bury for we are by the sea here, and the meadow where we drill is about two hundred yards off… We go on bathing parade every other morning at six o’clock but we are not obliged to go in the water and it is not a dangerous place because there is no breakwaters. He also wrote If Ned joins…, indicating that when they last spoke it was not certain that Ned would, still less Arthur. Three days later he had time to write at length. I have been to Folkestone twice, I walk sometimes or we can go by bus. 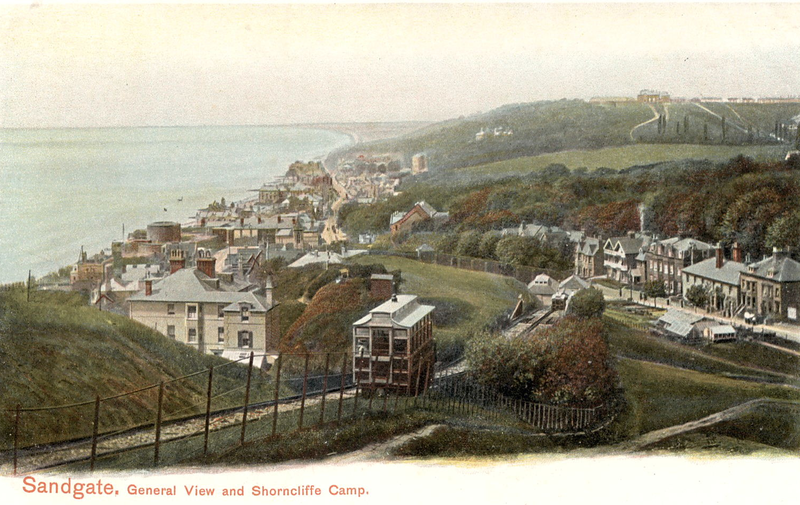 Folkestone is a very pretty place and so is Shorncliffe. The meadow we are on is flat and round us are big hills of chalk, which look the colour of smoke, and on the other side we can see the sea. We are right close to the sea yet we are about one hundred feet above the level and it is an awful hard job to get up and down from the sea. There are no breakwaters here because the beach is very steep, and when the tide is down we can see rocks, and children climbing about on them to get crabs, and the beach stones are big here different to Felixstowe. He also investigated the local facilities: All the public houses about here are closed at nine o’clock. The best place of amusement here is the Victoria Pier at Folkestone, there is a skating rink and shooting gallery and picture house all on the pier. It is open free on Tuesday nights to soldiers, and other nights we can go to the pictures and all over the pier for threepence (28 Sept 14). Unlike his brothers at Shoreham, George was fortunate in the matter of accommodation. On 20 October he reported that We get plenty of wet here now, it is alright slipping and sliding about between the tents, but by the end of October he was in barracks. Perhaps because he joined up in the first tranche of volunteers, he received some basic equipment promptly. We have all got a rifle each [though they were probably the obsolete Lee-Metford, not used for live firing] … but some recruits who came from Ipswich when I did have not got their uniforms yet. There are thousands here without uniforms (7 Sept 14). I was lucky in getting my uniform, Jackaman did not get his till this afternoon and I got mine on the ninth day after I came to Bury. They have got no more khaki, Jackaman’s clothes are white canvas, mine are khaki just the same as regulars (28 Sept 14). But on 8 January 1915 he reported that we have all got a second suit of khaki now for Sundays, and khaki overcoats followed two weeks later. To be properly dressed and equipped was important to the New Army volunteers to confirm their identity as soldiers. Having photographs taken for distribution to family and friends was part of that process. I saw my photo in the window of the photographer’s shop the other day, as an advertisement (26 Nov 14). He kept one for himself and sent eleven home. By mid-November they were firing on the range at Hythe, but now we have done firing, they have took our new rifles [Lee-Enfield?] away and give us old ones (4 Dec 14). George, like his brothers, generally preferred to send his washing home rather than rely on the army’s laundry service, but didn’t explain whether this was because it was cheaper, quicker, cleaner, safer or because (as in the case of his younger brother) his mother would darn any holes in his socks. Occasional food parcels from home supplemented army rations ─ onions were a peculiar request but duly supplied ─ whereas Aunt Nelly sent an unsolicited parcel this week, cake, pipe and tobacco, some very nice fish paste and some peppermints (29 Jan 15) Meal arrangements were chaotic when the 7th first arrived at Shorncliffe (We have to rush for our food when it comes, we have to look out for ourselves), but there were no complaints about the food itself. I shall not find fault as long as I get as much food as I do now … We have hot meat and potatoes every day for dinner but no pudding. The only day we had a cold dinner was the day we came from Bury. For breakfast we have either bacon, ham or salmon. For tea we have jam or cheese (11 Sept 14); We have some rare old dinners here now, plenty of puddings and potatoes and soup (29 Jan15). Smoking tobacco was at first a problem for the army: They do not allow us to smoke cigarettes, but they don’t mind us smoking pipes. That soon changed, and on the eve of leaving for France Our Lieutenant gave us (no. 9 platoon) a quarter pound packet of tobacco each, then they gave us another ounce each, and almost as many Woodbines [cigarettes] as we could carry (30 May 15). But there was a time and place for it. I had to go before the captain yesterday for smoking on parade before the first halt. It is against battalion orders so I got two days C.B. (Confined to Barracks; 6 Feb15). This was not George’s first brush with authority. In November he admitted I have had three days C.B. for disorder in the barrack room. I and another chap were playing about, and somehow we knocked a bowl of water over. Earlier, at least, he reckoned that Army discipline was not a problem: I like my corporal because he is fairly strict … The Sergt Major is very strict, and some of them say they would like to shoot him but I don’t mind him (7 Sept 14). The reason for this relaxed view, and indeed perhaps the reason why George enlisted so promptly, may have been his dislike of ‘old Limmer’, Colonel Thomson’s farm foreman at Bridge Farm Grundisburgh and George’s boss. He referred to him frequently: I have got on better here than ever I did with Limmer (1 Oct 14). It appears that Limmer had soldiers billeted or even required to work on the farm. I don’t expect Limmer think much of them soldiers being about on his farm. I expect he opens his mouth (5 Nov 14). It would be funny if them soldiers suited old Limmer, I expect they make him swear (19 Oct 14). Perhaps because farm labour had become scarce Joe began to work for Limmer as a cowman. I am glad father gets on all right with old Limmer, he used to make my blood boil sometimes, and so I did his, so there was no love lost. I never could keep my watch fast enough for him (30 Nov 15 ─ more of George’s humour). But after his experiences in France in 1915, in the summer of 1916 he was exploring the possibility of getting back to work on the farm: I see by the papers that farmers will be allowed to have men for haysel [haymaking] and harvest. I doubt whether old Limmer will be able to have me because he has got as many men on that little old farm as some big farmers have. Home service men only will be allowed to go. If they won’t let old Limmer have me perhaps I could get somewhere else (31 May 16). Another link that George kept with farming was his interest in pigs. Like his brothers he kept some at Grundisburgh which were probably sold when he joined the army. I don’t think father could have done better with my pigs. Trade must have been very dull last Tuesday or Jim Upson’s would have sold better (7 Sept 14). His mother evidently kept him in touch with Joe’s pig-keeping: I am glad father and Cecil are satisfied with the pigs. I expect it is a funny trade now. There are no markets about here so I don’t study pig trade much now (6 Feb 15). But when he had been briefly at Bury he visited the market, no doubt to check on what the pigs made. 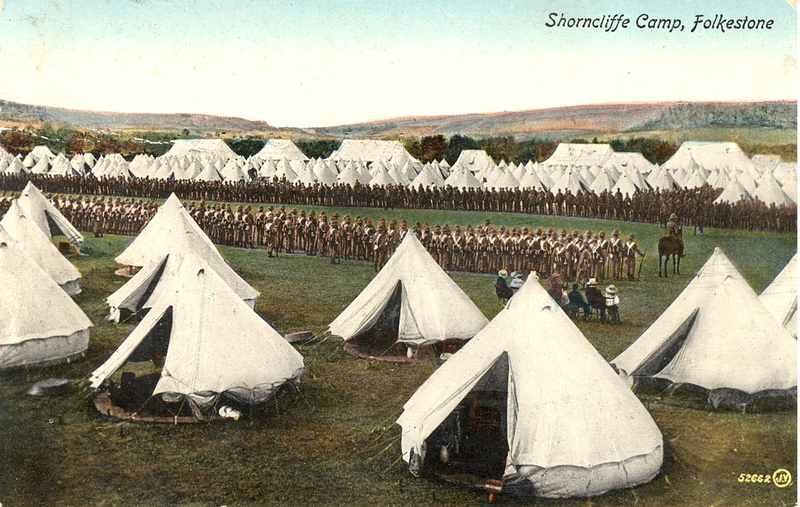 On 24 February 1915 the 7th left Shorncliffe for North Camp Aldershot, marching for five days in icy weather via Ashford, Maidstone, Sevenoaks, and Redhill. As well as the roughly 60 lbs (27 kilos) of kit to be carried, the women and children snowballed us out of Ashford, one of them hit me right in the neck, I did not think much of that. After completing about 50 miles from Shorncliffe, on the fourth day halfway to Redhill (on a day’s march there would be ten minutes rest every hour and 40 minutes halfway), the state of his feet forced George to fall out. I had new boots on and they hurt my feet…The doctor said I could not move any further so I rode the rest of the way [to Redhill] on the sick wagon (28 Feb 15). From Redhill he went to Aldershot by train, where he had a hospital dressing applied to the foot. Given that his comrades with blistered feet nonetheless had to complete the march, George’s boots were clearly causing a serious injury. At North Camp the battalion was initially housed in Blenheim Barracks, built in the 1890s (funny old barracks here, not so nice as the ones at Shorncliffe [5 March 15]). With Hilda sick with scarlet fever at home and their mother not well, ill-health was a preoccupation at this time. The day they left Shorncliffe, the chap who had measles in my room died and was buried last Friday [at Shorncliffe Military Cemetery]. I felt sorry, he was a nice little chap about eighteen, his name was Kerry from Lowestoft (28 Feb 15). Sidney Kerry was in fact 16, and the fact that George was unaware of his true age indicates how reluctant under-age soldiers were to reveal it to anyone. 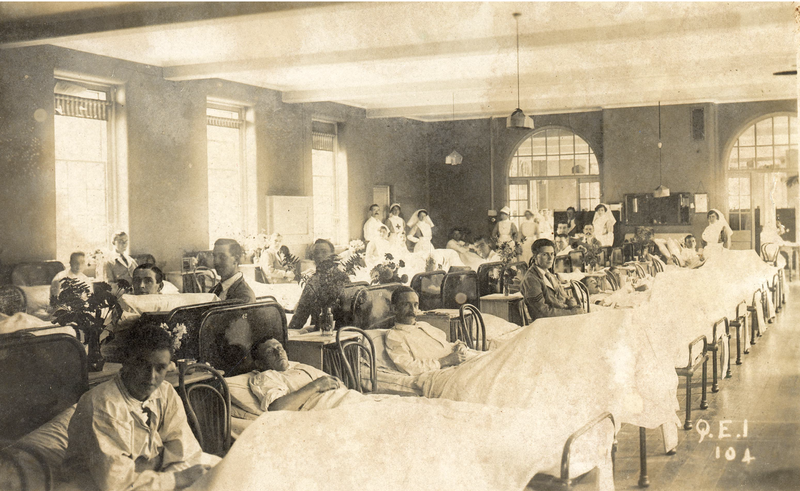 Two more from his room were taken to hospital with illnesses, and our lieutenant has got measles now, scarlet fever keeps breaking out (26 March 15). The mood was not much brightened by a move for two weeks to Pendennis Barracks at Crowthorne, about ten miles north of Aldershot, where the troops were obliged to complain about the inadequate food. But on the social side things improved, which may have been to do with an invitation to Sunday tea George and a mate received from a schoolmistress in Crowthorne. Back at North Camp he reflected I was sorry to leave Crowthorne. If I tell you the truth Aldershot is the worst place I have been at. The march back was arduous, starting at nine, then in trenches all day till eleven at night, then we had about nine miles to go, our coats were drenched and our feet were wet. Then when we got here we had our rifles to clean … (7 April 15). Watching the aeroplanes from Farnborough Common, buzzing about from morn till night, was only a modest distraction. The training regime at Aldershot was evidently tougher and more focussed than the life at Shorncliffe, though George did not often complain. He probably most enjoyed firing on the range. Before leaving Shorncliffe his marksmanship had earned him a shilling (5p) from his platoon officer, a useful bonus on top of his pay of seven shillings a week (less 1½d for national insurance). 7/Suffolk showed particular aptitude on the range, being placed ahead of the other battalions in 35th Brigade (7/Norfolk, 9/Essex and 5/Royal Berkshire) in their ‘musketry’ course (Murphy, p89). Otherwise it was drill, route marches, trench digging, night work, and mock attacks. George found himself on the sick list in mid-April with a boil on his ankle, which prevented him going with the rest of the battalion briefly to Finchampstead. In fact he was still excused all marching a month later: I seem to be a bit favoured in our doctor’s sight (16 May 15), and was not required to parade until 21 May. What did help George enormously ─ and his brother Ned ─ was the generous support they received from a family in Aldershot, the Harveys. The two families were very close but the nature of the relationship was for many years a puzzle to successive generations on both sides. When Ned was killed Joe Harvey wrote a letter of condolence in which he addressed Ned’s father Joe Goodchild as ‘cousin’ ─ a rare statement of the relationship ─ and indeed they were first cousins. Joe Harvey’s father was born Joseph Goodchild in Capel St Mary Suffolk in about 1830 but moved to Aldershot during the 1850s and changed his name from Goodchild to Harvey, doubtless because of trouble with the law. This Joseph was brother to Henry Goodchild, Joe G’s father, and the two Joes were good friends though neither seems to have explained to their families the true nature of the relationship. Perhaps track-covering had become a habit since as late as 1955 a son of Joe H wrote to a son of Joe G exploring possible familial links between Harveys and Goodchilds. If the formal relationship was mysterious, the family friendship was very close. Joe Goodchild had spent some time working in the Aldershot-Farnborough area, possibly after he and Etta married in 1892 when jobs in Suffolk were scarce and unrewarding because of the agricultural depression of the time. Undoubtedly they urged George to spend time with the Harveys, which he did. I went to Joe Harvey’s last Wednesday night and again on Sunday. He lives next to the ‘Wheelwright’s Arms Inn’ [converted into flats in the 1990s]. They showed me all round about here where father used to cart bricks … The house Joe lives in is his own, he calls it Capel Cottage. He has several cottages about here and he is building some more now … Joe’s boy’s name is Arthur, he is twelve years old … I suppose you know they live in Waterloo Road (17 March 15). (A letter to Hilda from Arthur Harvey in 1960 is addressed from Capel Cottage, 20 Waterloo Road.) I went and saw Joe Harvey on Friday night as I knew we were coming here [Crowthorne] (22 March 15). Joe Harvey came to Crowthorne one Friday by train. As I was walking towards the station I met him. He said I was several miles from home so he came just to see how I was getting on (7 April 15). I am going to see Joe again tonight. I expect he is wondering because I have not been down this week (10 April 15). Last Saturday evening I went to see Joe … Joe’s boy very often comes up here (15 April 15). I went down to Aldershot yesterday and spent an hour or two with Joe Harvey. They say if they come to Suffolk at Whitsun they will come and see you (26 April 15). I went and saw Joe Harvey last night, he got back here on Friday night about half past ten. He, like me, would rather have stopped in Suffolk … Joe’s boy came up here [North Camp] this morning, and they are coming to see me off this afternoon (30 May15). In his final letter before leaving for France George was, as usual, quietly philosophical: I don’t mind going, I go with intentions of coming back. I will level my old rifle at one or two of them if I have a chance. As an uncomfortable reminder of the perils he would face, We have a respirator each to protect us from those deadly gases which they use. Gas ─ chlorine ─ was first used by the Germans on 22 April 1915, but a gas mask offering some protection had been distributed to all soldiers by 15 May (Corrigan p. 166), which appears to be a remarkably swift response. However, George does not indicate that he ever needed to use it. Ned was probably less fortunate, as by late 1915 the British army was also using gas, and had developed an improved mask (the P helmet) which was effective against the more toxic phosgene gas employed by Germany before the end of 1915. One piece of personal defensive equipment which was not issued to British troops until 1916 was the steel helmet which gave some protection to the head and shoulders against shell splinters and shrapnel. The two ships ‘Invicta’ and ‘Queen’ with the 7th Battalion Suffolk Regiment aboard left Folkestone for France on the night of 30 May 1915. By then the battalion had been training with the rest of the brigade for nine months. That period seems to have been normal for the K1 divisions. Wilson suggests that “To many soldiers the business of training seemed unduly protracted” (p. 250). George did not admit to boredom or frustration, but he made an interesting observation on the apparent delay: They are slow in sending us to the front but it is the officers that are not fit, they have to understand a lot before they can take us out there. They are short of officers at the front, and these officers which we have here will have to learn a good deal more yet before they will be trusted with us in their hands (2 April 15). Leaving aside whether they had learned enough, it is interesting to compare Winter’s rather casual assertion that “the army proved that officers could be manufactured as easily as Other Ranks” (p. 69) with Corrigan’s (and George’s) more measured view: “It was one thing to find the men, quite another to provide officers and NCOs to command and train them” (p. 65). The latter were required in France with the BEF as well as at home with the New Army volunteers. Newly-commissioned subalterns, fresh from universities or public schools, had much more to learn than the men in their charge. The 7th Battalion landed at Boulogne during the night of 30/31 May. Now that it formed part of the BEF (XI Corps, 12th Division, 35th Brigade), letters home were subject to censorship by the Company commander (normally a captain), or if in a green envelope with a signed declaration (‘I certify on my honour that the contents of this envelope refer to nothing but private and family matters’) letters were liable only to ‘examination at the Base’. There were also printed Field Service Post Cards which allowed the sender to insert ‘date of letter received’ plus signature and date. Less good news could be deleted if inappropriate, leaving the best-possible pre-printed reassurance ‘I am quite well. Letter follows at first opportunity’. Nothing else was to be written. In practice and for obvious reasons, George’s letters from France (or at least those which have survived) tended to become less frequent (none between 27 June and 20 July, and thereafter only three brief letters until 6 October). The information which they were not allowed to contain included where the battalion had been, was now, or was moving to. Hence reconstructing George’s movements depends partly on general military and regimental histories, and partly on George’s letters once he was back in England in hospital. In bare outline, from Boulogne the battalion moved by rail and road to Acquin on 31 May. It remained there for four days. “On June 5 the division marched to Campagne, and on the 6th to Pradelles ─ a long, unforgettable march rendered tiresome and exhausting by pavé [cobble] roads, thoughtless staff work, and great heat ─ an average of nearly two hundred men [ie nearly 20 per cent] falling out in every battalion. On 7 June they reached the 12th Divisional concentration area at Nieppe” (Murphy p. 89: Acquin is west of St. Omer, north of the N42 near Lumbres. Campagne-les-Wardrecques is south-east of St. Omer, south of the N42 near Renescure. Pradelles is on the N42 east of Hazebrouck. Nieppe is on the D933 north-west of Armentières). As the crow flies, Acquin to Nieppe is thirty miles, marched in three days. In marching order a division (comprising three brigades or twelve battalions) occupied fifteen miles of road. For a period of six weeks the battalion was in the trenches at Ploegsteert (north of Armentières on the D69), where they alternated roughly every six days with 6/Essex between the front line and support trenches, with intervening periods of rest. It appears that George’s C Company went into the support trenches for the first time on 12 June and came out on 20 June. They were back in on 4 July and due out on 23 July. Presumably this pattern continued during August and into September, though George was hospitalised (at Dieppe, according to his discharge papers, via the Casualty Clearing Station at Bailleul) during 11-19 September with scabies. On 26 September the 7th Battalion was withdrawn from Ploegsteert, to be redeployed in the Loos sector. That day was in fact the second day of the battle of Loos in which Ned’s 9th Battalion was heavily engaged. The 7th arrived at Merris (south-east of Pradelles) on 27 September “after a tiring march” (Murphy p. 90). The next day they were bussed to Gonnehem (north-west of Béthune, between the N43 and D937 roads); on the 29th they marched to Labourse, south-east of Béthune, and on 30 September they advanced to take over trenches from 1/Coldstream Guards in front of the Chalk Pit, north-east of Loos. 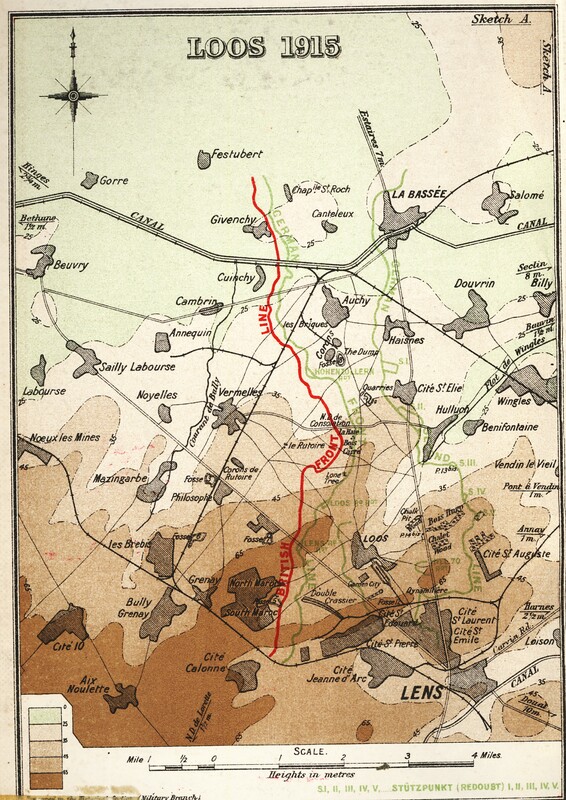 “The march up to the line was a difficult one, because owing to the main road to Loos being heavily shelled, a route had to be taken over the old British trenches, the advance in the dark being made difficult by the slippery chalk soil, and continually checked by wire, shell-holes, and the debris of the battlefield” (Murphy p. 91). On 2 October the Divisional commander Major-General Wing was killed. The 7th Battalion was relieved and went into billets in Noyelles on the 5th, but were back in trenches on 12th October. Next day 35th Brigade, with 7/Suffolk on the left and 7/Norfolk on the right of a one-mile front, attacked the Quarries to the west of Cité St. Elie. “The volume of smoke proved inadequate to screen the operations from the Dump, as planned, and, in addition to receiving heavy frontal fire, the brigade was enfiladed [fired on along the advancing line rather than frontally, and this more effectively] from Slag Alley and from a number of machine guns at the foot of the Dump, some of which took the 7/Suffolk in reverse”. Neither this nor the associated attacks “improved the general situation in any way and had brought nothing but useless slaughter of infantry” (Edmonds 1928, pp. 383, 388). The circumstances of the Battle of Loos are dealt with more fully in discussing Ned’s war, since he was involved almost at the beginning, but the outcome of the offensive was a defeat for British forces. During 13-16 October the BEF lost almost 300 officers and 6,700 other ranks, a casualty rate much greater than that of the German army. A German counter-attack on 19 October was beaten back, and the following day the 7th Battalion came out of the trenches for five days rest at Béthune. It returned slightly to the north of its previous location, and was evidently engaged in repairing trenches in the captured western portion of the Hohenzollern Redoubt when George was wounded, on 4 November 1915. George’s own account of his five months in France is dramatic. His time with the BEF started well. In what is undoubtedly a reference to the ‘tiresome and exhausting’ three-day march to Nieppe, I used to fall out on the little marches which we had in England with sore feet, but I stuck to this one easily. Ned will come in for some marching when he gets here he will find. At Nieppe the battalion was billeted, two to a house; his house-mate was Edward Banham from Great Barton near Bury, who was killed a few weeks after George was wounded. They are paying us five francs a week, which is four and twopence in English money and a lot less than the seven shillings he had been receiving, but we live a good deal better than we did at Aldershot. His first experience of trenches was reasonably comfortable: There are some fine trenches here, well constructed of bags of sand, but we are not actually in the firing line (12 June 15). The 7th was withdrawn from its introduction to the front-line trench on (probably) 20 June, an experience George described in his quietly ironic way: I sent one or two lumps of lead over, and they echoed back too. But when out of the trenches we get plenty of food so there is no need for you to send anything … We have a two ounce tin of navy cut allowed us every week, and they nearly give tobacco away in this place. As well, the French girls come round selling buns, oranges etc, they are nearly all in black. But parcels did arrive including one from the Harveys, and an accordion, perhaps unsolicited, from his cousin Hilda Goodchild in Great Wenham in Suffolk. 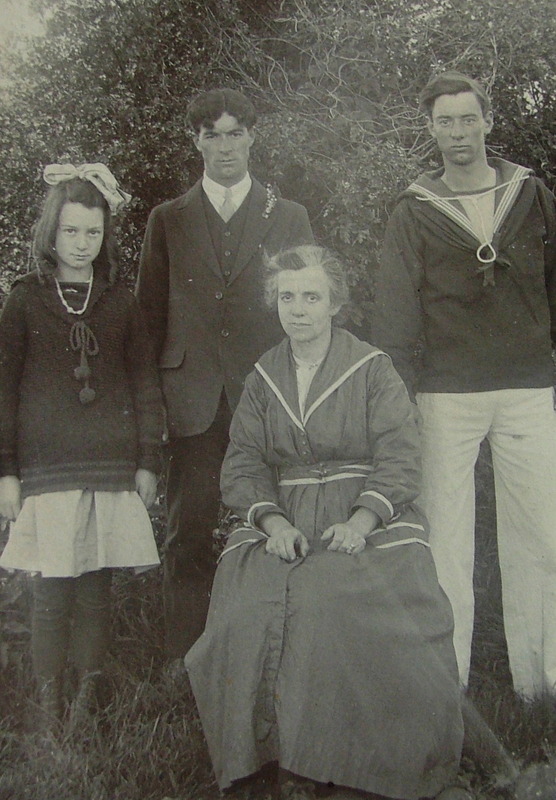 Hilda was born in 1893, like Ned, and seems to have been the only cousin who wrote frequently to the brothers (and to her aunt and uncle in Grundisburgh after Ned was killed. She was the daughter of John and Sarah ─ another Goodchild-Salmon marriage like that of Joe and Etta.) The accordion found employment at an open-air church service on 18 July, though it was not George who played it. But he did share in the cake and chocolate, cocoa and coffee which our platoon officer had sent us from his home. The description of trench life that he wrote on 20 July was notably less harrowing than his account written from his hospital bed in November. That was partly because there are certain things which I cannot tell you ─ either censorship or to preserve his mother’s peace of mind ─ but it is interesting to know our goings on, I shall have plenty to tell you if ever I come home again … I have a piece of news to tell you about Orsi, we were laughing and talking about Ipswich yesterday, several of us. Of course you know we get plenty of shell fire, and one of them came and burst right in the midst of us. The dirt flew up and knocked Orsi down into the bottom of the trench. He was holding his head, I thought he was killed but however it didn’t hurt him. [Pte V.Orsi, a friend from Ipswich, survived for over three years until he was killed on 22 August 1918]. It is quite a lively time in these trenches, there are all sorts of firing. You can just picture us in your minds when that shell dropped, there was a splutter and the report of them is enough to knock us down…I haven’t been out here long, but I can say I have experienced it, and I can assure you that it is a very hard and rough existence indeed…When we are out wiring at night we have to crawl through the long grass on our hands and knees, between ours and the enemy’s trenches you see. It is dark when we are on that job, we are like so many kangaroos jumping on our hands and knees, with our rifles in our hands. Two of our fellows amused me the other night. They were about five or six yards apart, they stood looking at each other through the long grass ready to fire, they both thought each other were Germans…I was laying behind them laughing at their capers…The trenches have names just like streets have in town. There are so many trenches that they have to be numbered, so we shouldn’t lose ourselves…We have had a lot of casualties but of course I mustn’t tell you who or how many. All of us on this job are likely to have our lights put out at any time. You wouldn’t believe how these shells travel, they travel at a lively tune (20 July 15). George’s next substantial letter was dated 6 October, by which time he had been laid up in hospital with scabies, a kind of itch, ten miles from the firing line and having an excellent rest (13 Sept 15), after which he returned to the 7th Battalion on 19 September. The 7th was then withdrawn from the Ploegsteert sector and sent to join the later stages of the battle of Loos. A few lines to let you know I am still existing in good health, although after a fashion…I expect you have seen in the papers that we broke through the German lines and advanced. We were amongst that lot, and a somewhat rough time we spent. I have been wondering how Ned got on, his lot were cut up next to us on our left. We suffered fearful losses and I shall never forget the sights I saw. We left the trenches last night and I hope we are in for a rest. Since the attack they have given us a rough time with their shells, they wiped us out in all directions. I received Arthur’s letter, but I haven’t had time to write to him…I am glad he isn’t in trenches or he wouldn’t stand a very good chance. It is a marvel how some of us got through it, a fellow’s life isn’t worth twopence in a crib like we were in (6 Oct 15). 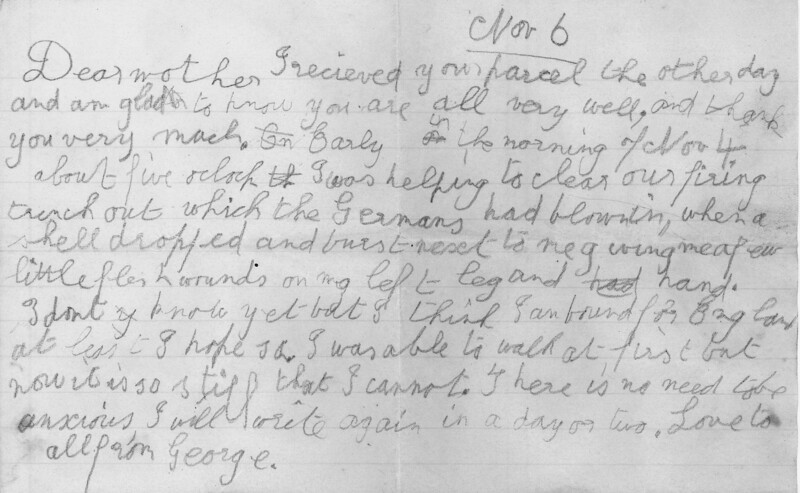 On 6 November George wrote to give the news which his mother must have dreaded receiving (though as it turned out what happened might have saved his life). First he observed the usual courtesies: Dear mother, I received your parcel the other day and am glad to know you are all very well, and thank you very much. Early in the morning of Nov 4 about 5 o’clock I was helping to clear our firing trench out which the Germans had blown in, when a shell dropped and burst next to me, giving me a few little flesh wounds on my left leg and hand. I don’t know yet but I think I am bound for England, at least I hope so. I was able to walk at first but now it is so stiff that I cannot. There is no need to be anxious, I will write again in a day or two. Love to all, from George. This letter bears no address, but was probably written while he was en route to Lahore General Hospital in Calais. It was here, safely back in England, that on the 11th he wrote his fullest account of what had happened a week earlier. I copped a slight flesh wound on Nov 4, [I was] told by shell, but now I have come to a conclusion that it was a bomb [hand grenade]. I was in the Hohenzollern Redoubt repairing the parapet which had been blown in. I walked two miles to Vermelles, then I went by car to Cambrin, stopped there an hour or two, then they took me to the clearing station for the night. The next day they put me on a Red Cross barge, then I had 48 hours ride down the La Bassée canal and reached Calais on Sunday afternoon, stopped there till yesterday morning (10th), got here last night. It is not a bad wound, it is just serious enough to get me to England, it is my left leg just above my knee. The poor old 7 Suff have had a shaking, there are about 200 of the old Batt. left. I was at Ploegsteert, Belgium, 3 months, and when the Loos battle came off they wanted another division to go and help them there, so Gen. Wing our division commander volunteered to take us there. We weren’t actually in the charge, but we had to dig ourselves in, and we were even shelled by our own artillery. General Wing soon had his light put out, also the second in command. 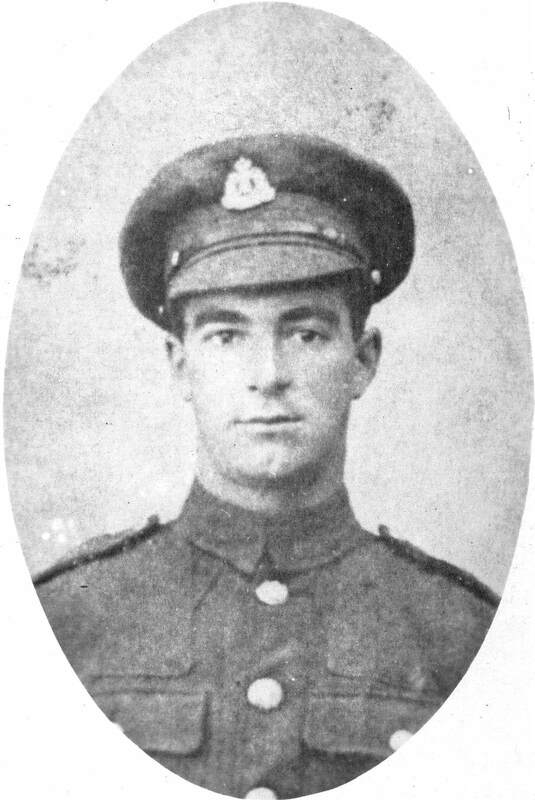 On October 13 we made an attack in the Redoubt, G Martin [L/Cpl George Martin of Great Bealings] was killed there. We lost 17 officers altogether. This was the attack on the Quarries at Loos, in which he reckoned in a letter to Ned (22 Dec 15, three days after Ned was killed) that the battalion lost 400 men. On 4 November George had had a classic ‘Blighty One’, an injury severe enough for him to be returned to England but which should not be life-threatening provided he received prompt and appropriate treatment. As he later admitted, When I got hit I was wondering whether I should get home, I was thinking more about getting home than I was about my wounds (23 May 16). Transport by barge was normally reserved for those cases so severely injured that they were not expected to survive a journey to hospital by rail, so it was presumably the proximity of Cambrin to the canal that secured his place. As early as 8 November he expected to be up in a few days, I could walk now but they won’t let me … I reckon I shall be home about Christmas time. I got hit in about a dozen places, it copped me on my left side, it merely stung me. There are 3 wounds on my leg about ¾ of an inch long. They are the worst and they are only flesh wounds. The others are healed up and the ones on my leg are healing too quickly I am thinking. He was right to be cautious. On 28 November, They say I mustn’t get up until my leg is a bit better. There are three wounds on my leg, two in front and one behind. I wondered how the wound came behind, but the nurse discovered that a piece of shrapnel went right through, it just touched the bone. They dress it every 12 hours, and they syringe it right through. The pain must have been intense, with the constant risk of septicaemia. Eventually surgery was required, and on 6 December he ‘came clean’ to his mother on the situation: Now I will tell you all about my poor old leg. On Nov 30 the doctors told me it wasn’t doing satisfactory, and he said he would clean it the next day. So on Dec 1st they gave me a dose of chloroform and I was very soon in dreamland. When I came to I felt as if I had been blind drunk. I was sick, I felt rotten, and had a sore leg in the bargain. The piece of shrapnel went in at the side / front and came out behind and it left some specks in and a lot of rubbish which are in these bombs. So the doctors opened the wound from where it went in to where it came out, so it is about 3 inches long, at one end it is half inch wide, and the end where it came out is nearly an inch. The day following the operation it was terribly sore, but since then it has been getting better every day. It is an excellent job done, and I am very pleased with what the doctors done, it is going on simply grand now. Of course I knew the operation was to come sooner or later, and I wouldn’t tell you till it was over. I think you have enough anxiety now, without worrying about operations. Previous to the operation, the wound had been discharging, like my boils used to, nasty white stuff. After the operation the doctor said that it would never have healed with that rubbish in. I am able to bend and straighten the leg, it is still sore, but is going on lovely, and I think and hope it will continue so. I suppose I shall be getting up sometime between now and Xmas. I expect they will give me a pair of crutches to walk with. You asked me in your letter to tell you all I could about my leg. I have now told you the whole pedigree about it, the absolute truth. I am quite contented here, I think I can stick in bed another fortnight if they wish me to. While he lay in bed, George had time to reflect on his experiences in France. Whatever expectations he may have had a year earlier, it is clear that he was severely shaken by the reality of trench warfare. When I got hit there were four of us standing close to each other, talking and smoking, Ford and Palmer they were on my left and they both got killed by the same bomb that hit me, the other fellow was on my right and he escaped (28 Nov 15). Death came arbitrarily. In his letter to Ned on 22 December, returned to him with the envelope marked in pencil ‘Killed in Action’, George revealed that on 13 October A piece of shrapnel went past my head and took a little piece out of my right ear, something he had not revealed to his parents. Tell Cecil from me not to enlist, it has put years on me. I was in France nearly six months, it seemed about six years (8 Nov 15). Until he went into the trenches George seemed to have confidence in the orders that he received from officers and NCOs, but from now on his attitude hardened, and his voice became more assertive. He could still reflect ironically on life in the trenches ─ [Ned] has been through the same performances as I have, it isn’t all fun ─ but he was also bitter that the battalion had been misused, and determined that if possible it should not happen to him again. Ned mustn’t put too much faith in what they say about that rest [ie withdrawal from the front line]. We were promised a rest at the beginning of September, but we never did get it. After we made an attack on Oct 13 we left the trenches on Oct 20 and they took us about nine miles from the firing line at Bethune. They gave us new clothes, the colonel gave us a lecture, he told us we had done well, and that we were going down to the base for a rest. After being at Bethune five days they marched us back to the trenches, we had only ten officers and there weren’t above two hundred of us. If Kitchener had seen us and he knew we were the 7 Suffolks, I will swear he would have wept at the sight of us. After we had been in the trenches a few days, they sent a draft of men and officers from Colchester. If you had seen us going to the trenches with ten officers, you would certainly have thought it was England’s last hope, there wasn’t a good platoon of us altogether. I hope Ned will get his rest, as I can assure you that every man on active service has my sympathy (23 Nov 15). From being one of Kitchener’s volunteers, George had become an ‘old soldier’: less trusting, more aware of the need for self-preservation. And he vowed I am out of the army at first chance (23 Dec 15). Mention of Ned in this letter was nothing exceptional. Whenever he wrote home he expressed his hopes for his two brothers. They did write to each other, but mainly they wrote to their mother (often complaining that they had written to X or Y who had not replied). But Etta acted as a kind of clearing station for news and information about where they were and how they were coping, which she could pass on. In his first letter from France Arthur told his mother that “it’s better than Felixstowe”, a comment which probably amused her and which she passed on to the others ─ which explains remarks such as George’s I am sure [Arthur] wouldn’t like trench life better than Felixstowe, especially if he had to dig himself in under shellfire (6 Oct 15), and Tell him [Arthur] to stick it, poor boy, I bet he would rather be at Felixstowe (6 Dec 15). They liked to read the ‘Suffolk Chronicle and Mercury’ for news about the war as well as about home, and especially to see the casualty lists. George wrote from Graylingwell asking for the Mercury to be sent every week if possible. Hilda wrote a letter to her injured brother, I expect she had some help … I shall be pleased to see another one (28 Nov 15). His reply to her gave great pleasure: I am glad to know I set Hilda up with that letter, tell her she beats Cecil, tell him from me that he is slow making a start (6 Dec 15). Cecil was a reluctant correspondent, probably reckoning that he was busy enough at work and could get all the news from letters to his mother. Even when he did put pen to paper his older brothers gently teased him. I was pleased with Cecil’s letter, but I couldn’t help laughing over it, it made me think of one of ‘Snookey Okum’s’ kittens in ‘Comic Cuts’. If he writes regularly no doubt he will improve. I hope he won’t be offended at this little remark … (19 Dec 15). One universal aspect of trench life that George had managed not to mention while he was in France was the problem of vermin, but hearing from his mother of Arthur’s problems triggered recollections. I know by my own experience that Arthur must be lousy, one good cure is to rub carbolic soap into the seams of the underclothes, lice can’t stand carbolic. It is no use of throwing lousy shirts away as new ones will get as bad in a few days if nothing is used to prevent them. It is awful to think of it but he is used to that, I was used to it. When I was in trenches at the beginning of the summer I used to take my shirt off every day if I had time and kill every one I could see, and then I couldn’t keep them down without using stuff to stifle them. The metaphor of ‘lice as Germans’ was irresistible and typical of George’s ability to find gentle humour in a barely tolerable life: They used to mobilize faster than I could put them out of action (22 Jan 16). The other bugbear of George’s life, old Limmer, was even harder to forget. George’s father Joe was now working for him as a herdsman. Father will find it isn’t a bad job looking after bullocks, the old man is ignorant … (8 Nov 15). You may tell old Limmer that his old boy is still alive, I didn’t think much of him but I would rather be there than in France. One good point about the old man, he didn’t throw bombs at me (28 Nov 15). Joe was probably finding it was hard going with the cattle: Tell father I hope the next lot [of heifers] won’t run him about so much (6 Dec 15). But George knew what Limmer was like as a boss: The old colonel can’t move without him, old Limmer follows him about just like a dog. Old Limmer is so ignorant that he thinks other people are the same. Whenever I was at home on leave the old man was alright with me then, but there is some fault with everybody in the old colonel’s eye through old Limmer… The old colonel is old and innocent or he would not have the old man. Old Limmer hasn’t had anybody to suit him yet, he had good men and didn’t know it. He wants somebody he can do as he likes with (19 Dec 15). Cecil meanwhile was working for Hunt at Park Farm, and George reckoned that he should be getting more than 13 shillings (65p) a week on a job like that (23 and 30 Dec 15). But Cecil also had a sow so he was getting an income from pigs. On 30 December George wrote to say that Xmas passed very pleasantly here, dancing and whist drives and we found stockings full of little things hanging on our beds on Christmas morning. I have a pair of crutches, I can hop along with them fairly well now … I am pleased to know you spent a nice Xmas … (which indicates that news of Ned’s death did not reach Grundisburgh until after the holiday). But on 1 January he wrote again. Ned wrote me a nice cheerful letter on Dec 18, he told me of the bombardment which was going on, and he expected to go back to the trenches at any time, and he must have went back the same night as he wrote the letter and met his death the next morning. It is very grieving indeed for us, as he was so dearly loved by us all. He went forward and did his duty without trying to wring out of it. I hope you received my letter which I sent yesterday. It is impossible for me to get out of hospital for a few weeks but it is possible for me to be sent to Ipswich if someone of more consequence would speak for us. It was nobody’s fault that the poor boy was killed, so don’t make any more fuss than you can help, but it is very hard for us I know… I am enclosing Ned’s letter, you will take care of it, it is a cheerful letter indeed, and he met his death with the action of a man, it is very sorrowful, but there is no shame. I am sure he was quite happy till it happened, he told me he was lucky to be alive. Other people have sacrificed their loved ones too, and to make the best of it we cannot help grieving at the loss of him who was so dear to us. George’s reaction to the death of his brother was to seek a transfer to Ipswich hospital to be nearer to the family. For the move to happen he needed the support of someone with influence, and his former employer Colonel Thomson contacted WL Gibbings of North Gate, Chichester to intercede on George’s behalf. He visited George twice in January and spoke to the C/O of the hospital, but the initiative came to nothing. The problem seems to have been the reluctance of one of the wounds to heal. Had it done so George would have been discharged promptly without the need to transfer. Until it did, Graylingwell was reluctant to let him go. In fact on 3 February he was deemed fit enough to travel home, but he had decided to spend the night at Aldershot to repay the Harveys’ kindness to him: I think I must go home by Aldershot and see them. They were good enough to come and see me (29 Jan 16). 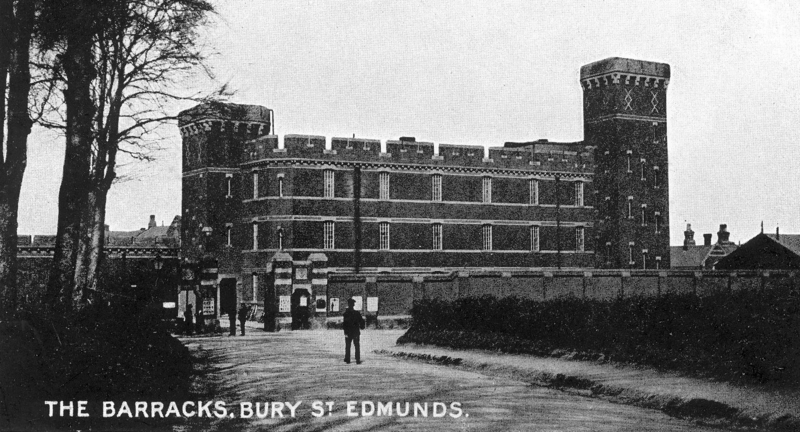 George had ten days leave ─ the first time Etta and Joe had seen him since May 1915 ─ before reporting to the Suffolk Regiment depot at Bury St Edmunds on 14 February 1916. A few days later he found himself in Felixstowe, transferred to B Company, 3rd (Special Reserve) Battalion. The function of the 3rd was to receive and train both new recruits (who since January were conscripted), ‘Derbyites’ (men who under Lord Derby’s scheme of October 1915 had agreed to report for service as soon as required), and men who were recovering from wounds. Drafts of trained and fit men were then sent overseas to make good the losses sustained by the battalions serving with the BEF. There was therefore a continuing turnover of personnel, including old friends and acquaintances through whom George could make contact with others. There are several fellows here from my old platoon, one of them is going to the seventh [battalion] again next week, so he will tell them he saw me (19 Feb 16). Most of the time George was billeted in requisitioned houses in or around Garrison Lane, the battalion HQ being in the (also requisitioned) Ordnance Hotel. But in other respects this was not a comfortable period for George. He was still partially disabled by his wounds, and weekend passes to Grundisburgh were difficult to get (I am so near home, yet I can’t get home. I would come every week if they would let me (19 Feb 16); but far more troubling was the constant threat that he would be sent back to the trenches. Passes were not only difficult to get, but also not guaranteed until a few hours before they began (5pm on Friday), which served to increase the frustration. George did get home in mid-April, probably for the first time since he arrived at Felixstowe and after a series of disappointments, and again at the end of May. Friends and family could come to Felixstowe, but a rendez-vous might be hard to keep. Whenever anyone is coming you must be sure and let me know, as you would never find me … Cecil must let me know when he is coming another time (23 May 16). Worse happened a month before, while George was at Landguard Fort (about two miles south of the town). Arthur Harvey came down here yesterday. He sent a telegram yesterday morning to tell me he was coming, so they gave me a pass and I was at Beach station when the 12 o’clock train came in. He wasn’t there, so I started walking towards Town station. I asked at Town station what time the next train came in from Ipswich, they told me 10 past 2, the 1 o’clock train had then gone through to Beach station and that was the one he was on. I kept on walking about and couldn’t find him so I thought he hadn’t come. I went down to Landguard a little before 5 and they told me he had just gone. I didn’t know anything about the 1 o’clock train till afterwards. But then the customary refrain: I will try and get a pass on Sunday morning till Sunday night and get home if I possibly can, but I shan’t know till Sunday morning (27 April 16). The other way of getting home demanded a degree of resourcefulness: If I was able to bike alright I would come home on a Sunday without a pass, I could dodge that barrier alright at Walton (28 March 16). It isn’t clear whether cycling became any easier, but there was certainly a cross-country route part of the way: If it rains on Saturday I shall not be able to come on Sunday, because I have to cross some wet meadows (14 June 16). Evidently it stayed dry: I was fairly tired last night when I got here, but it doesn’t matter as long as I got back without getting into any scrape (19 June 16). The likelihood of being sent back to France never completely went away. Indeed, we now know that more than half of repatriated casualties were sent back to the front: Winter (p. 197) says two-thirds. Having experienced the absolute horror of trench warfare, it is inconceivable that George would have resigned himself to going back. But in addition his elder brother had just been killed, and his younger brother was enduring the discomforts and uncertainties of Salonika. On 19 February he wrote that I wouldn’t mind going to the front again now, which cannot have been what he meant since in every other letter he made it clear he would mind very much indeed. Either side of that sentence he wrote I don’t mind how much I have to do here [Felixstowe], it is better than France … I will keep here as long as I can for the sake of you. They cannot send me out if I cannot march. It may be that he was feeling the pressure of loyalties divided between his comrades still in France and his parents. But with new recruits ─ conscripts, including some who may have declined to volunteer in 1914-15 ─ arriving at the battalion he probably felt that as a volunteer he had done his bit and it was time for others to do theirs. Hence he was not prepared to make it easy for the army to send him back, and his mother agreed: You [mother] are right about the trenches in France, it must be simply unthinkable (28 Feb 16). In the same letter he expressed his determination: I tell you I am not going to the front any more and I mean it too, and two weeks later, writing to Cecil, They will send me to France again if they possibly can, but not if I can help it. However long the war lasts, I don’t think they will get me out there again … Scores of my old mates from the 7 batt. have been sent back again but they won’t get me back. On arrival at the battalion at Felixstowe he had been excused wearing puttees [leg bindings], so I am not fit to do any guards. The wound to his leg was healing, but slowly: When I first got here they gave me a pack and rifle and they thought I was going to do some marching. I showed them that I couldn’t march so now they have taken my pack and rifle away and have given it to someone who can march (28 Feb 16). My leg doesn’t ache now unless I walk too far, and it is still very weak (21 March 16). And on 4 April They put me on the march on Friday, when we got as far as Walton I fell out, and I had to report sick, and the doctors excused me of all marching and I am still excused wearing puttees. In the early weeks he did a variety of jobs: I am able to do picquets, sometimes I help the orderly man and sometimes I am on an observation post on top of St John’s church watching for strange ships and aeroplanes … I am having a nice easy time here now … (28 Feb 16). The feeling that his wounds had earned him a special treatment that might prove temporary began to appear in his letters. I am pleased to say I am having a nice easy time … I think it is too good to last though (10 March 16). They are busy here picking drafts out for the 2nd and 7th Batts. but somehow they don’t trouble about me, they always skip over me and I hope they will continue so (21 March 16). The question of his fitness came to a head on 8 April and his future in the army appeared to be settled: I went for medical inspection this morning and they consider me fit for permanent home service, so I know now that I am not going to France any more. They were three doctors from the “War Office”. They asked me if I was getting any better, and they got me to walk up and down the room. I showed them that I was fairly lame. They were going to give me my discharge, then the sergeant major of my company told them I was able to do light duty, so then they marked me home service. As an example of what he might be required to do, I am on a bit of a police job now, I have to stand at the bottom of Queens Road and stop civilians from entering the garrison without a pass. We don’t require rifles for that, we just have a belt and bayonet and a stick, and we do four hours a day each. But George remained acutely aware that many other soldiers were getting a rough deal. Some fellows are more lame than I and marked fit, it is one’s luck I suppose (17 April 16). Some more of my old pals from the 7 Batt have come here, some cannot hardly walk at all and they are all marked fit. That fellow Beecroft who had a piece taken out of his arm and had it put in his leg, he is here and is marked fit… These army doctors can’t tell whether a man is fit or not, some fellows are absolutely useless and the doctors mark them fit just to see what they will do (19 May 16). I was lucky in catching that war office board, fellows keep coming in from Bury off sick leave with a big A to their names, and some of them are nothing but cripples (29 May 16). My old mates keep on finding their way down here, the old doctor keeps on marking them fit and sending them out as fast as they keep coming (14 June 16). George was still suffering from his wound ─ sometimes it is so stiff I can hardly walk, you wouldn’t believe how the weather affects it ─ but he was very well aware of his good fortune. Even so, he was not prepared to be pushed around. Compared with the mild George of twelve months earlier, he had learned to use a quite different voice: I reported sick this morning. I told the old doctor that I could not carry on with sleeping on boards. I told him I ought to have a bed. He tried to make a laugh of me, he asked me if I would rather have a feather bed or a horsehair bed. Then he asked me if I wanted anything else. I argued the point with him, now he has ordered me to be billeted in a house with about a dozen more old crocks … Of course I might have been here before, if I had only reported sick. I suppose you know there is a house known as the “rest home” for each regiment down here, where fellows are sent for treatment. Well, I am billeted next to that. We have spring beds and clean pillows, almost like being in hospital. I am glad I went sick. The worst of it, I shall have to go on night duty before long … If they put me on night duty I must report sick and tell the doctors that I can’t do it … My leg seems a bit stiff now, and I know I don’t ought to do any night duty (20 June 16). This was not the first time George expressed a reluctance to do night duty, presumably because it brought back stiffness and/or pain in his leg, or perhaps recollections of the trenches. I don’t mind what I have to do during the day, as long as I can have the nights to myself I don’t mind (28 Feb 16); The thing I don’t like about Zepps is having to turn out at night. Last Sunday night they turned us out into the trenches from quarter past twelve till quarter past four. That properly put me in the mind of France … (4 April 16). At the end of April he had to leave the comparative comfort of billets in the town when he was posted in a small detachment of infantry to Landguard Fort, where they were accommodated in huts. It is alright here, the only fault I have with Landguard, it is so lonely, a terrible long way from Felixstowe (27 April 16). But back in Felixstowe in May he was put on a machine gun coursefor home service, and it was this which raised the prospect of regular night duty. In June he was hopeful that he might be discharged from the army altogether (his plan to be posted home for agricultural work having come to nothing), but They won’t discharge me while I am on this machine gun. I think I deserve my discharge as much as anyone. It will cripple my leg, being out half the night on an old gun. I must go sick when they put me on it (27 June 16). Two days later he clashed again with authority: I had a flare up with the old doctor this morning. I reported sick and told him I couldn’t do any night duty. I went in the medical inspection room and he told me to clear off out and get on with my duty. I wouldn’t go out, I told him I wanted my leg examined and so I got him to examine it and he told me I was fit for anything. I told him it was no good of him telling me I was fit. I contradicted him and told him that I knew myself that I wasn’t fit for any night duty whatever. I told him my leg got worse every day, and he could see I was determined not to do any night duty, and so he had to give in and he has excused me of night duty. Whenever I go sick I have always worked the old fellow after a bit of arguing. They say he used to be a pig doctor, and I don’t think it is far out. We fired a machine gun course this week. I put nearly all the bullets over the target so they should chuck me out of it [remember George’s earlier pride in his marksmanship with a rifle]. They marked me a first class shot and I know I didn’t put above one or two on the target. I am still in the machine gun section, but I am not going to do any guards, so I reckon I shall get chucked out of that (29 June 16). George’s disaffection with Felixstowe seems to have been complete, but two days later his life changed again. In May that year a new battalion of the Suffolk Regiment was raised, the 2nd (Home Service) Garrison Battalion. It is worth remembering that as late as 1 March 1916 the County of East Suffolk believed that a German invasion was still sufficiently likely that it issued “Revised Instructions For the Guidance of the Civil Population in the event of a Landing by the Enemy on the Coast”. The task of the new 2nd Battalion was essentially coastal defence in the Harwich garrison area (the 1st Reserve Garrison Battalion had headquarters at Gravesend for defence of the Thames Estuary), and on 1 July 1916 he was in E Company at Redoubt Camp, Harwich. We have got to do guards here, they say if you get excused of guards you have to do them just the same. They don’t have any [medical] boards in this batt., so of what I can make out I have got to soldier on and say nothing. I would like to get my discharge but I can see now I shan’t be able to get it until the war is over. It seems that George was resigned to remaining in uniform for the duration, but at least This place is rather better than Felixstowe, it is a change anyway (was George consciously echoing Arthur in making a comparison with Felixstowe?). There was potentially excitement on 4 July when King George V reviewed the troops of the Harwich garrison. “The troops marched past, the 2nd Garrison Battalion presenting a steady and workmanlike appearance, and acquitting themselves with considerable credit” (Murphy p. 344) ─ damning with faint praise? However, George was on guard duty at Parkeston Quay and presumably missed out on the occasion of the royal visit. Certainly he made no mention of it when he wrote on the 5th, but he did note that there is something doing in France now. I am glad I am not there, it is worse there now than ever it was at the beginning. The ‘something’ was the Somme offensive, which opened on 1 July with 58,000 British casualties that day. That was the last letter or card that George’s mother kept in what seems to be a fairly complete series. But it certainly did not mark the end of George’s army service. From his Discharge Documents it appears that he served for the entire duration of the war until the end of March 1919 when he was transferred to the Class Z reserve, a short-lived reserve created in December 1918 (when it was feared that Germany might reject peace terms and resume hostilities). Following a Medical Board report in September 1919 in respect of his leg injury and a hernia he was awarded a gratuity of £35, which relative to average earnings was the approximate equivalent of about £3500 in 2012. However, at some stage after July 1916 George left the 2nd Garrison Battalion, and indeed left the Suffolk Regiment altogether. According to the cover sheet of his discharge papers George was transferred into the Z reserve in 1919 as 52998 L/Cpl Goodchild from the 1/10th Royal Scots. Did this mean that he had been, as he hoped, discharged from the Suffolks and had then decided to re-enlist? If so why, and in what circumstances did he arrive at a Scottish regiment? It is extremely unlikely that he was unemployed if he temporarily left the army, but if he did indeed re-enlist, did he deliberately choose a Scottish regiment? Another document found with the letters is a distinctive bright red card, ‘A Permanent Pass of the 1/10th (Cyclist) Batt. of The Royal Scots’, dated 10/4/1918, giving 52998 L/Cpl Goodchild G of A Company permission to be absent from his Quarters from 5.30pm till 11pm except when on duty’. The Royal Scots (The Lothian Regt) was the oldest regiment of the British army and the senior infantry regiment. The 1/10th Battalion was a Territorial Force unit, raised at Linlithgow at the start of the war and engaged in coastal defence at Berwick until April 1918 (coincidentally or otherwise the date of George’s pass), when it moved to Ireland. There are other items which establish that George served for a time in Ireland. One is a picture postcard (of Felixstowe!) written and posted in Holyhead at 4am on 3/10/1917, with the message Reached here safely. G. The only possible reason for reaching Holyhead is that he was about to board (or perhaps had just disembarked from) the Irish ferry. 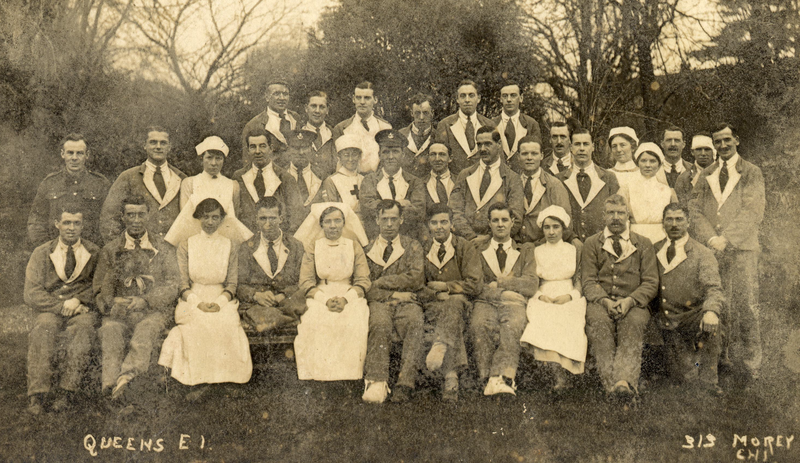 The second is a group photograph, unfortunately much deteriorated and undated, of NCOs (including L/Cpl G Goodchild) of a Scottish regiment apparently at the barracks at Newbridge, co. Kildare near Dublin. The third is a picture postcard of Tralee, on the west coast of Ireland but with a Woodbridge postmark dated 26 December ─ the year must be 1918 ─ from George and addressed to Cecil at the Royal Naval Barracks Chatham. The message suggests they planned to celebrate Christmas and imminent demobilization: If you come on Sat. night and there is no-one at Ipswich stn., get on tram to Cornhill and come to Gt White Horse Hotel yard. We will be there till 10.45pm. GG. Finally, George named the house he built in 1924-5 ‘Clonmel’, a town on the border of South Tipperary and Waterford. A further mystery is that the cover sheet of the Discharge Documents bears a partly legible stamp with date 21 March 1919 and ‘Hamilton’, which was the base depot of the Cameronians (Scottish Rifles). The following sheet has ‘7th Suffolk Regt’ crossed out and replaced by ‘5th Scottish Rifles’. Not only is regimental no. 12279 crossed out, but so too is what appears to be no. 36369. The history of the 5th Scottish Rifles at this time is hard to follow, but they may also have been in Ireland before disbanding in May 1918. Is it possible that George arrived at the 1/10th Royal Scots via the 5th Scottish Rifles? Both were Territorial Force battalions, and perhaps the Royal Scots took over the duties in Ireland of the Scottish Rifles in April 1918. So much unfortunately is just speculation.